During the warm weeks in March the snow melted and the soil in my garden thawed, so I could start digging over my winter cover crop. As the ice in the soil turns to water, growth again becomes possible. I planted seeds to celebrate the coming of spring and covered them with a glass cold frame for warmth and protection. During this spring climate transition, our gardens reveal some of the important factors that control Earth's climate. We can see the role of water in its three forms (phases) — ice, liquid and vapor. The spring transition really starts after the sun's energy has melted the snow and thawed the ground. Then with warmer soil and liquid water, plants and deciduous trees prepare to grow new leaves. This process takes many weeks for trees. Until the leaves emerge and are fully grown, evaporation (transpiration) is very low. Without evaporation to take up a lot of the sun's energy, the ground and air warm rapidly. With little evaporation, the atmosphere stays dry. With clear skies and less water vapor — a powerful greenhouse gas — to reduce the cooling of the Earth to space, we get frosts at night. 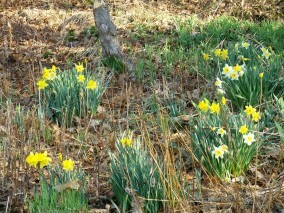 This doesn't bother the south-facing daffodils, which bloomed very early this year around the beginning of April. Of course, weather systems can upset this simple pattern by blowing in warm moist air from the south or cold dry air from the north. 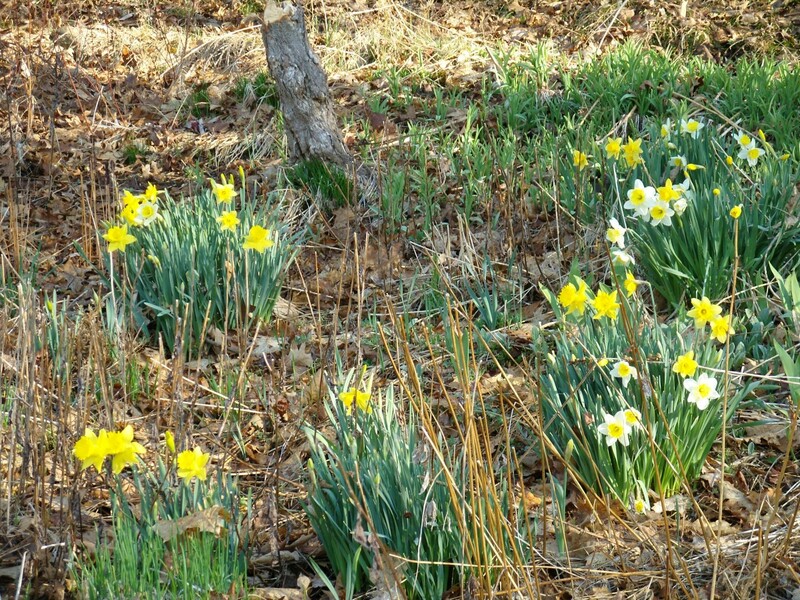 This year the spring transition started early with an especially warm spell in mid-March. Then it rained and got cold again. My lettuce and spinach had sprouted, so I covered them again with the cold frame. Then a high pressure system settled in over us with warm, moist air from the south. On April 2 and 3 we shattered high-temperature records across northern New England, reaching the lower 80s in Burlington. And warm moist air aloft meant no frosts. Soon, rather suddenly in early May, the climate will change again as the trees leaf out, and transpiration becomes significant. Evaporation of water takes up a lot of energy. This cools and moistens the air so that more clouds form. Frosts are usually over until the leaves die in autumn, because both moist air and clouds stop the Earth from cooling as fast at night. As we move towards summer, the sun climbs higher in the noon sky and the nights get shorter, so that temperatures again move upward. Vermonters used to wait till Memorial Day before planting frost-sensitive plants like tomatoes; but as our climate gets warmer, the last frost is coming earlier by about three days each decade. The spring ice-melt on small lakes in Vermont shows a similar trend. My garden is at a low elevation, and I now plant frost-hardy plants in April and start planting frost-sensitive ones in early May. With this year's exceptional spring warmth, I hopefully planted lettuce, spinach, radishes and peas in mid-March — and they are all growing well! Spring is a time for new beginnings. Plant some new seeds in your life — seeds that will grow for a fall harvest and ideas that will help you reconcile your wants with the needs of the Earth. Despite all our past foolishness, the future is not inevitable. What will happen to our society and the Earth depends on our collective creativity and vision and our willingness to work together to create a more resilient world for our children. Will you support our local farmers this summer as they expand our food supply? Will you support the development of renewable energy supplies in Vermont? Whatever your choices, breathe in the scents of spring and give thanks. Read in more detail about the Seasonal Climate Transitions.